For more than 50 years, stable carbon and oxygen isotopic compositions of calcium carbonate, especially foraminiferal tests, have been used in paleoenvironmental studies because the variations in these isotopic compositions are useful for estimating certain aspects of paleoenvironments such as global sea level changes, paleotemperature, global deep-sea circulation, and huge methane release events from the seafloor. The stable isotopic compositions of benthic foraminiferal calcareous tests have been used as tracers for the seafloor paleoenvironment. In general, isotopic values of benthic foraminiferal tests are determined by several factors including isotopic compositions of bottom water, temperature, and some other vital effects. However, little has been clarified concerning the detailed relationship between the isotopic compositions of individual tests and the characteristics of their ecology. By quantifying the detailed relationship between the isotopic compositions of tests and ecological factors, we will be able to broaden the range of application of calcareous microfossils as paleoenvironmental tracers. Calcium carbonate samples of at least 20-400 micrograms are needed to determine stable carbon and oxygen isotopic compositions at a useful accuracy and precision. That is to say, we have had to prepare several to tens of foraminiferal tests to determine stable isotopic compositions. The reported isotopic data of individual foraminiferal tests are limited to those taxa that have large and thick calcareous tests. Thus, it has been difficult to determine the isotopic dispersions of each foraminiferal taxon by using the conventional method. Recently, in Ishimura et al. (2004 and 2008), we developed a high-precision analytical system for determining stable carbon and oxygen isotopic compositions of sub-microgram quantities of calcite; these quantities are less than 1/100 (0.2 microgram- ) those of conventional analytical methods. By using this system, we can determine the carbon and oxygen isotopic values for small individual foraminifera weighing less than 10 micrograms. That is to say, we can determine the stable carbon and oxygen isotopic compositions for almost all kinds of foraminifera, including foraminifera of the minimum size. In a new study, I am going to estimate the microhabitat of small benthic foraminifera based on the isotopic dispersion in the same species sampled at the same depth at the same station. The results are expected to be very useful for choosing appropriate paleoindicators in future paleoenvironmental studies. From 2006-, I developed a new analytical system based on the system invented by Ishimura et al. (2004) to improve the stability and precision of isotopic analysis of calcite. In addition, to control the analytical system, I also developed the operational software for PC made with LabView (National Instruments Co., Ltd.). 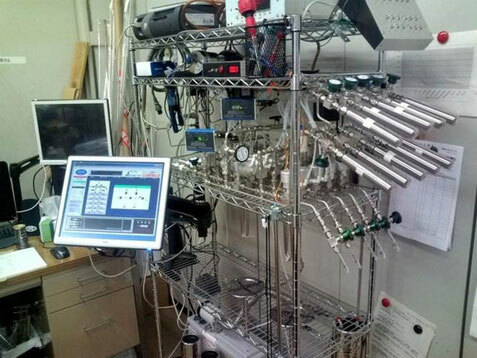 This new analytical system can analyze the stable carbon and oxygen isotopic compositions of sub-microgram quantities of calcium carbonate, and, we can determine the isotopic compositions of CO2-gas within standard deviations of +/-0.05 ‰ (for both the d13C and d18O), and one grain of NBS-19 (5.6 ~ 12.5 microgram) with standard deviations of +/-0.03~0.10 ‰ for d13C and +/-0.10~0.14 ‰ for d18O.